Scott O’Dell, MA, CSCS, is the Director of Strength and Conditioning at East Central University of Oklahoma. Author of the book, The Power Revolution, he has been an NSCA conference speaker in areas such as plyometrics and strength development. Legendary NFL running back Walter Payton retired from the game with a host of league records, including most rushing yards and most all-purpose yards. However, his most impressive achievement may be that, despite playing in one of the league’s most punishing positions, he started every game of his 13-year career but one, and that was due to a coaching decision, not an injury. When asked about his remarkable durability, Payton attributed it to the sand workouts he put himself through in the offseason. In the time since, the benefits of sand training have been well documented, and athletes ranging from basketball players to boxers have followed Payton’s lead. Sand training is a simple, low-impact form of resistance training. According to a 1998 Belgian study, running on dry sand requires 1.6 times more energy than running on stable surfaces, and walking in sand requires 2.1 to 2.7 times more energy. This increased resistance helps improve quickness and build explosive strength because the muscles experience a greater workload during training exercises. A sand workout is also useful for improving an athlete’s cutting ability because the resistance of the sand makes it easier to achieve the ideal 45-degree body angle when accelerating out of a cut. When cutting, the foot plants in the sand, causing the body to react with a harder knee drive upward. This helps develop the high-knee motion critical to the acceleration phase of sprinting and eliminates wasted backward leg movement. It also trains the athlete to keep positive shin angles–where the ankle is behind the knee–which is an important component of acceleration. In addition, maintaining the 45-degree angle keeps an athlete’s hips low while cutting, which provides more activation of the glutes, hamstrings, and quadriceps, and takes energy and stress away from the knees. 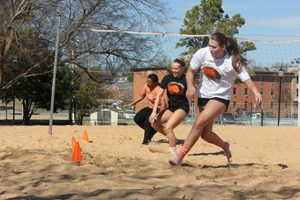 Here at East Central University of Oklahoma, athletes work out in the sand two days a week during the offseason. When a team first begins plyometric work in the sand, we allow the athletes to run through the exercises at their own pace so their bodies can adjust to the higher workload. Single-response plyometrics such as squat jumps and star jumps are introduced anywhere from one to three weeks later. These exercises involve performing a rep of a movement, reloading and resetting the body, and then repeating the process for the remaining reps. The goal for the athlete is to achieve good technique, while improving flexibility, balance, and overall body strength.